A Home Going service for Mrs. Greta Annabelle Somner, beloved wife of Melvin Somner Sr., daughter of the late Ethred and Frances “Dolly “Gibbons, daughter-in-law of the late Philip and Blanche Somner, loving mother to M. Philip Somner [Barbara], Mark Stephen Somner and Elizabeth Butterfield. 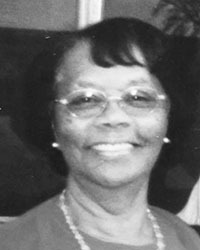 Beloved sister to Mary Smith and Gary Boochie Gibbons and the late Winifred Outerbridge, Edna Gibbons, Dorothy “Dot” Ince, Edith Trott, Angeline Outerbridge, Cora Douglas, Vera Proctor, June Wilmot and the late Claude, Kenneth “Bozo” and Hughen “Bob” Gibbons, sister-in-laws Phylis Fubler, Marsha Willams and Florence Somner, late brother-in-laws Warren, Brian and Jerome Somner and Daniel “Joe” Smith. Late sister- in- laws Evangeline, Roslyn “Peggy”, Pauline and Shirley Gibbons will be held at Crawl Gospel Hall, Hamilton Parish today Monday, February 18, 2019 at 12:00 pm. Lovingly remembered by grand children: Tanya Simmons [Frank], Lyndon Butterfield, Twynika Smith-Blakeney [the late Glenn], Christopher [Sandra], Raché Hodsoll [M’kai], Kara Doers and Markhos Somner; great-grandchildren: Jadon, Tamera and Jai Simmons, Zaire and Zavia Smith-Blakeney, Zahrya Battersbee, Chinyere and Massiah Somner, Chanz and Cheye Hodsoll in her 88th year of #3 My Lords Bay Lane , Hamilton Parish.